So I was staying with my beautiful friend Ariana in Astoria, Queens and she suggested we go for brunch to have paninis at a place called Il Bambino. My normal brunch would be more down the pancakes/eggs royale route, also my experience of paninis was that of those practical aeroplane food paninis you get at Cafe Nero. Little did I know what I was in for. A lovely, friendly little place with an outside area at the back too, we were welcomed in straight away. 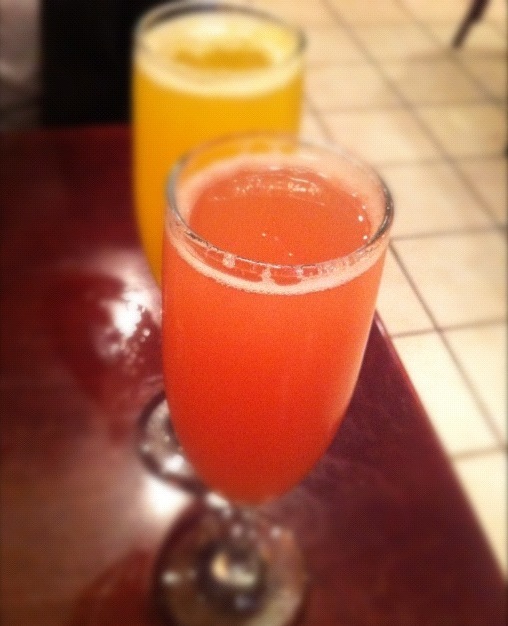 I chose a guava bellini, it had a good kick to it, not as sweet as you would imagine, but good nonetheless. We chose a crostini to begin with to share ($6.50 for two). 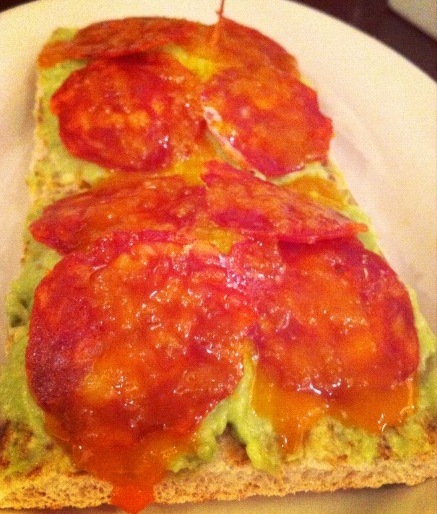 Avocado butter, chorizo, chili oil. OH MY GOD. It really does not get much better than this. The avocado butter was so fricking deelish it was hard not to go behind the counter, find the vat they no doubt have of the stuff and just dunk my face into it. The chorizo was salty and spicy at the perfect thickness and the chili oil, well that is the genius move, the kick of the heat pumped up the avocado butter like what the Tom Cruise divorce did to Nicole’s career. This is not to be messed with, it is unbelievably good. For the main attraction, in came the paninis ($11 each). I chose the Italian Meatloaf – onion jam, tomato pesto, spicy mayo, provolone and Ariana had the Notorious P.I.G. 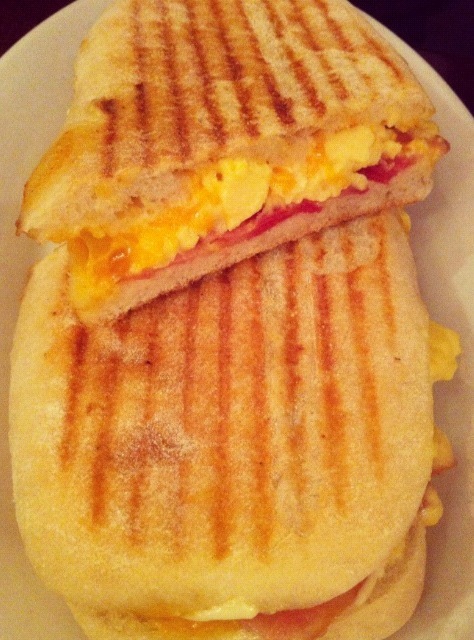 – Smoked bacon, scrambled eggs, artisan cheddar, truffle spread. baibva onqvioqb. SORRY, just wiping away the drool from my keyboard. 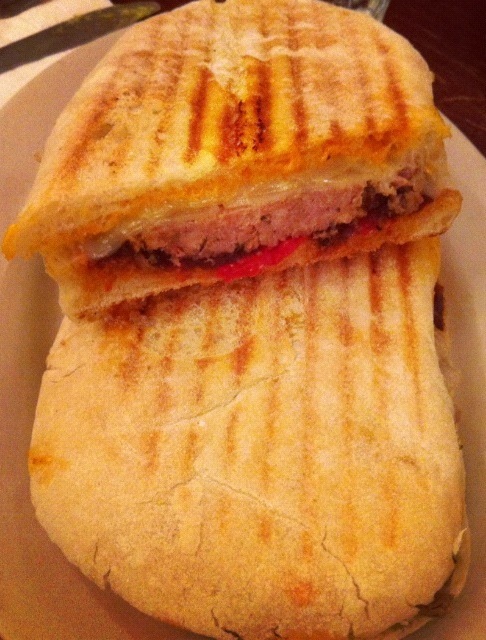 The meatloaf panini was a sheer delight. It reminded me a little of the meatball bolognese pizza I am so fond of at Pizza Express but really, this was in a class of it’s own. The soft meatloaf, perfectly cooked like Mum makes, was whispered with sweet nothings by the onion jam that just married the flavours so delicately. The spice from the mayo and the oozing of the cheese made for the most delicious brunch I think I have ever had. Who knew Cafe Nero could get it quite so wrong. The Notorious P.I.G. was utter brilliance. The scrambled eggs were cooked so well that you can see the yolk still oozing, which is always the best part of any other type of egg; poached, fried, boiled and so rare for scrambled. The bacon was the perfect compliment to it and far above all of it was the crunchiness and soft centre of the bread itself. So important and the base for all of this. Exceptional. The menu is fun and inventive and the essence of the place is really good food. I would go back in a heartbeat. Be sure to make this a must eat if you are in New York.